Faith-building ornaments for discovering Jesus. Make learning about Jesus easy and fun this holiday season with The Twelve Names of Christmas™. The names of Jesus reveal the many facets of who He is, and knowing these names will lead us to know and adore Him. 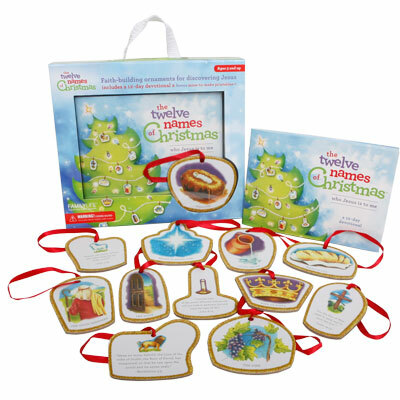 Each read-aloud story sets ups practical yet meaningful family time to explore Jesus through 12 brightly-colored ornaments. Hang all 12 at once at a tree-trimming party, or spread the decorating over 12 days leading up to Christmas morning. All uniquely illustrated, double sided, full color, glitter-rimmed ornaments represent names of Jesus including the Lion, the Lamb, Immanuel, and more. Each hangs from bold red ribbon, giving a beautiful yet durable ornament that welcomes your child’s interaction. These 12 names invite hands-on Christmas fun for your whole family. Q: Why teach my children more names than simply Jesus? Isn't that enough? A: The best way to foster love and adoration for someone is by getting to know that person more deeply and intimately. The same is true in encouraging your children's relationships with Jesus. Learning different names He is known by introduces your family to many of Jesus' wonderful qualities, all uniquely embodied in each name. It's simple enough: Knowing Him better will inspire you and your children to love Him more. Q: In what setting do these ornaments and stories work best? A: The Twelve Names of Christmas is easy and practical for settings of various sizes. You may choose to read the stories in the coziness of your own living room and hang the ornaments on your tree. Or you might choose to adapt the stories to a read-aloud devotion for a small-group setting, like a Sunday School class or holiday family gathering, and incorporate some of the mine-to-make printable activities. Q: Do I have to hang all 12 ornaments in one sitting? A: Make it work for you! You may choose to read all 12 stories aloud and hang each ornament on the tree the very first night that your tree is up. Or you may choose to select an ornament and story each night over the course of two weeks leading up to Christmas morning. There is no right or wrong combination. Any way you do it, your family will be having fun and learning about Jesus.